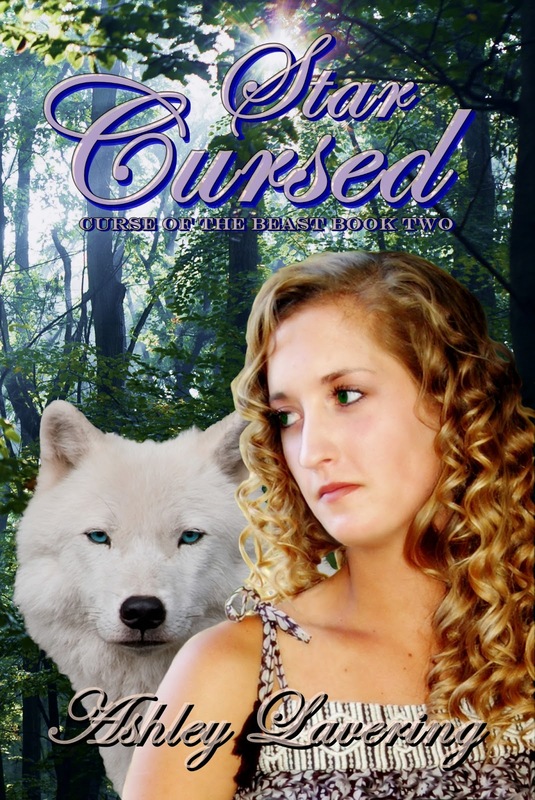 After I finished reading Curse of the Beast, book 1 in the series, I was very excited to read Star Cursed. This book was full of drama and romance; parts that make you cry , gasp and laugh. I really liked the connection between Tayla and Beast. It is so beautiful to watch her struggle with her love, as she thinks it is simply her inner wolf that loves Beast, and not her. Tayla goes through some inner struggles, which I think is important for her to better understand what her Beast, and all the other wolves have to go through. This book was really well written, had a fantastic story-line, and kept me interested the entire time that I was reading. I give this book 5 out of 5 (stars). Me: Perfect! First question: Have you always wanted to be an author? Me: That suprises me! Most authors liked to write since they were 4 or 5. How do you put up with it? Ashley: The love of creating the story has out weighed the writing part. When I write my goal is as little rewrite as possible:-) I will think about everything for a while and then write it down. It works but if you ask my friends I still have those days when I complain. lol I recite: "I am a writer and a writer writes!" Ha ha:-) It gets easier with every book I write also. Me: Interesting. What inspired you to write Curse of the Beast? Ashley: I was reading two authors at the same time, Robin Mckinley and Patricia Briggs. The result was a daydream where I saw a teenage girl standing in a large city with a growling werewolf by her side that she was trying to keep from killing a group of guys. From there the story grew by wondering how she came to have a werewolf in the city and what was making him so angry. Me: Really? How did your characters develop? Me: What was Star Cursed to you when you first started writing it? Was it basically Curse of the Beast but in a seperate book, or something more? Ashley: Writing Curse of the Beast, I found that it was getting too large. So I cut the 20-30,000 words off of it. I was then able to really tell her dating story instead of just mentioning it in one chapter. I also got to have so many more scenes with Beast, which I loved! The book grow to about 88,000 words. Originally, this book idea was only suppose to be one book but it has a mind of its own and now is going onto book three. Me: How is book 3 coming along? Ashley: Oh and I think I have a title. After Star. What do you all think? Me: The title is wonderful! I am so excited to read it! Are you going to make another Blog Tour for After Star? Ashley: Yes. I will do it all. I have a wonderful cover artist that I just hired (Design by Katt) So I will have a cover reveal, release day party, and blog tour. Me: I will definitely be signing up for that one :) How long did it take you approximately to write Curse of the Beast and Star Cursed? Ashley: Thanks Alex:-) Together they took me about 2 years. I am getting faster:-) Had to learn my craft that first little bit. I have been writing for 6 years now. My first novels are needing me to go back and revise them, but need to grow as an author. Now, I am revising them:-) but that is a whole other topic. Me: Are you currently working on any other books or series? Ashley: Yes. My first novel that I ever wrote is back in the picture for me. It is a high fantasy for New Adult. Enslavement is the first book in the Land Magic Saga. I am currently revising it and will be sending it to the editor the first part of Summer. Me: They sound interesting. Can you give us a little hint on what they are about? Ashley: Sure. Off of the top of my head: Azika is and orphaned slave in a mining camp. She is cursed with beauty that she hides under dirt and filth. But she has a bigger secret that even she doesn't understand. She feels the earth and what might lie beyond her prison. Then one day she is sentenced to the darkest deepest parts of the mountain and meets Bear. Together they struggle to escape. But how do you escape a mountain and the guards surrounding it? Me: Sounds very interesting! Are you excited about it? Me: Can't wait. What genres of book do you read? Me: What would you say was your favorite books? Ashley: The Frog Princess by E.D. Baker, All of Patrica Briggs and Stephenie Meyers, Under the Never Sky by Veronica Rossi, The Poision Study by Maria V. Snyder, Onyx by Jennifer Armentrout, Vampire Academy by Richelle Mead, Wild Magic by Tamora Pierce, J.K. Rowling, Rick Riordan.. and the list continues. Me: Do you have any advice to new authors? Me: I can't imagine a better note to end this than here. Thank you so much Ashley for taking the time to answer some questions :) I hope you have a great day. (PS: I hope you dont mind if I put this on my facebook page and blog). I think that the interview went pretty well. It was fun, and I cannot wait to be part of more blog tours featuring her books! A nomad at heart, I currently claim Nevadaas my home. I have a wonderful husband and two young children that put up withmy “writing time.” When she’s not pondering a spell that will magically calmthe ferocious winds that plague the air around her, you can find her, withnotepad in hand, frantically jotting down ideas in those short moments betweencaring for her girls and working full time at the Elko Institute for AcademicAchievement. Art and science have always been my yin andyang. Throughout my college career, I shifted between the two, but in the end Igraduated with a Bachelors of Mathematics and Science from the University ofWyoming. Charging into adventures and discovering something new has always been apassion of mine, but as a teenager I used to run screaming from a reading orwriting assignment. Looking back, the irony isn’t lost on me. Now you can’tcatch me without a book in hand or without an open word document. Every time anew idea pops into my mind my heart races and my hand twitch to write it. Inthat moment, I have my writer's high and pray it will sustain me throughthousands of hours of revision.